Forbes has once again named Babson the No. 1 college in its annual ranking of the 50 Best U.S. Colleges for International Students. "Earning the No. 1 spot for the second year in a row is Babson College, a specialized entrepreneurial school in Wellesley, MA, where every student receives a B.S. in business administration," according to Forbes. "Babson boasts a formidable international student population (26 percent) and is one of the few liberal arts colleges that offer need-based financial aid for international students. The school has developed name recognition worldwide." Just last week, Babson was also ranked No. 1 for entrepreneurship for the 21st consecutive time by U.S. News & World Report. 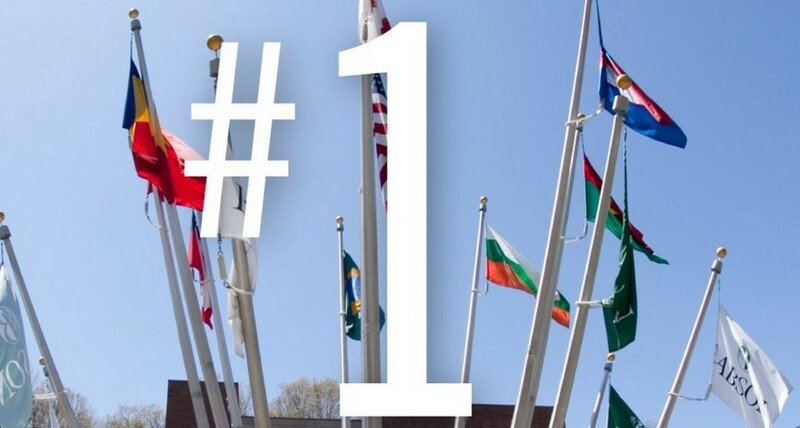 "Babson College is proud to offer a welcoming and transformative learning experience for students from around the world and we are thrilled to be recognized as the best U.S. college for international students for the second consecutive year," said Kerry Healey, Babson College president. "At Babson, students of all nationalities and backgrounds live and learn together. Our diverse international community instills all students with a truly global mindset and prepares them to create economic and social value everywhere." "At Babson College, we take pride in our increasingly global community. Faculty and staff strive to create an ecosystem which integrates international students into all facets of our campus environment," said Amir Reza, vice provost for International and Multicultural Education at Babson College. "In short, Babson is a family of students, scholars, and professionals that come together to create a microcosm of the world—the kind of place that cultivates humanity, creating a compassionate community where communication crosses global borders and facilitates the education of tomorrow's entrepreneurial leaders with a global mindset. International students are an integral part of this education and we are thrilled to be recognized as the most welcoming and nurturing campus for students from all corners of the world." Forbes' methodology favors schools with business or STEM focuses, with notable academic diversity in its list. To develop the annual list of the 50 Best U.S. Colleges for International Students, Forbes adds measurements of school quality (50 percent), the total percentage of international students (25 percent), the growth of the international student population (five percent), graduation rates for international students (10 percent), and the majors/programs of interest to international students (10 percent). From Forbes: "We focused on two questions when judging how good of a fit schools were for international students: What qualities in a school bolster specifically an international student's return on investment, and what schools show evidence of a strong commitment to international students? Starting with the 650 excellent colleges and universities in our 2017 Top Colleges, we gathered final release data from the Integrated Postsecondary Education Data System (IPEDS), the College Scorecard and from the Institute of International Education to compile our 50-school ranking."